So is it just me or has 2013 been moving at the speed of light so far? Okay. It isn’t really moving that fast…some days feel like they are dragging, but when I look back & realize we are ending the second month of this New Year I am thinking where did all the time go? Although I haven’t blogged here for a while I can assure you I haven’t taken a break from my creating…I have just been juggling a lot of balls & honestly it is naturally easier to just create…writing about it though…well that isn’t always as easy. So to give you a bit of perspective on what has had me so distracted besides my design business & the business of being a single mother…I do have to insert here that one of the highlights of the month was my daughter getting her pointe shoes. A big distraction & a moment of motherly pride over took me for a moment there, so I had to mention it…it happens sometimes. I am still writing for the examiner online as the Salt Lake Interior Design Examiner. I recently covered a whole lot of information on some of 2013’s color trends & forecasts which you can check out here. Then a somewhat newish adventure for me has been working part-time at Jcp’s (JcPenny’s) in the home & drapery department….which admit I am totally enjoying. I love the store, my managers & the associates there. I think it is a great fit right now for this Interior Designer. If you need blinds, shutters, drapes, bedding & or towels you should check them out. Product is great & pricing is amazing. We also just added a whole bunch of new products & lines in these departments…with even more to come including Happy Chic by one of my favorite designers Jonathan Adler. Now one of the reasons I mention this is because I have to give Jcp credit for the inspiration for this recent “Inspired to create by…” project. 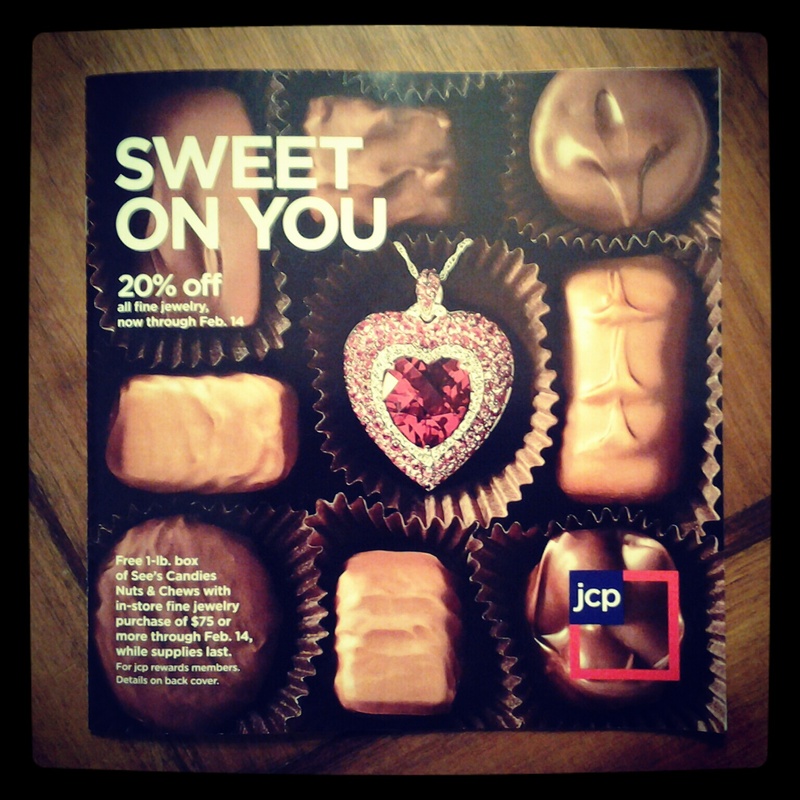 Just before February Jcp brought in a line of lab created gems & jewelry for Valentines. There were so many gorgeous choices & even though I try so hard to avoid the jewelry department I couldn’t avoid its sirens call when I saw this pretty ruby & white sapphire gem in their ad campaign, plus I have a huge weakness for pavé gem settings. In the last few years symbolism has become very intriguing to me & I am using it quite often in my design work, so maybe that is the reason that despite any of my usual reasoning & avoidance of things attached to the word cute…I fell head over heels in love with hearts this past Valentines, as well as a newly heightened passion for lace glitter…all of those beautiful romantic symbols of love. 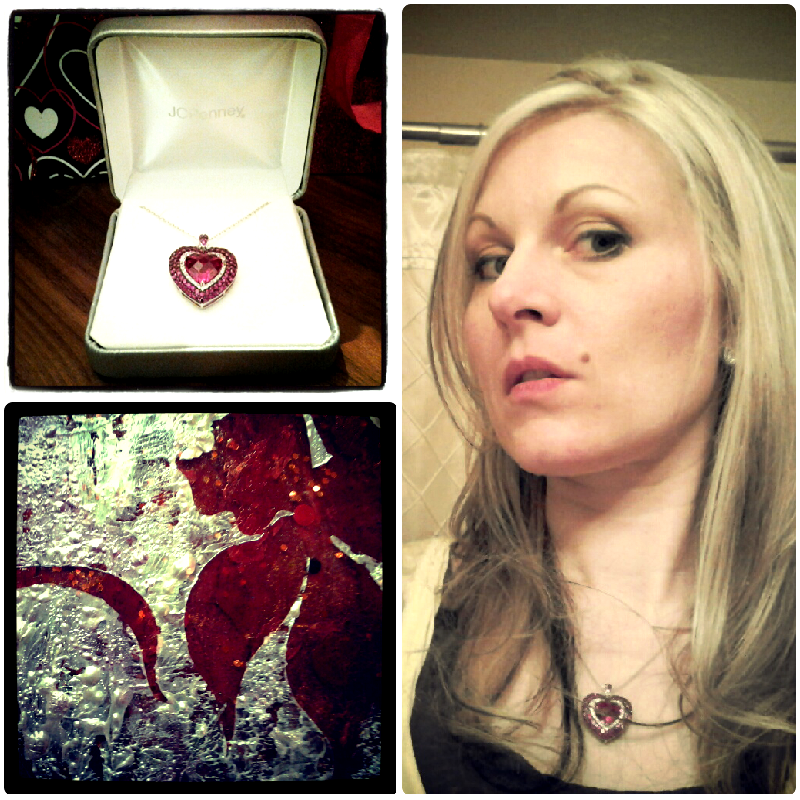 So from this jewel my little Valentines Moxie painting was born. 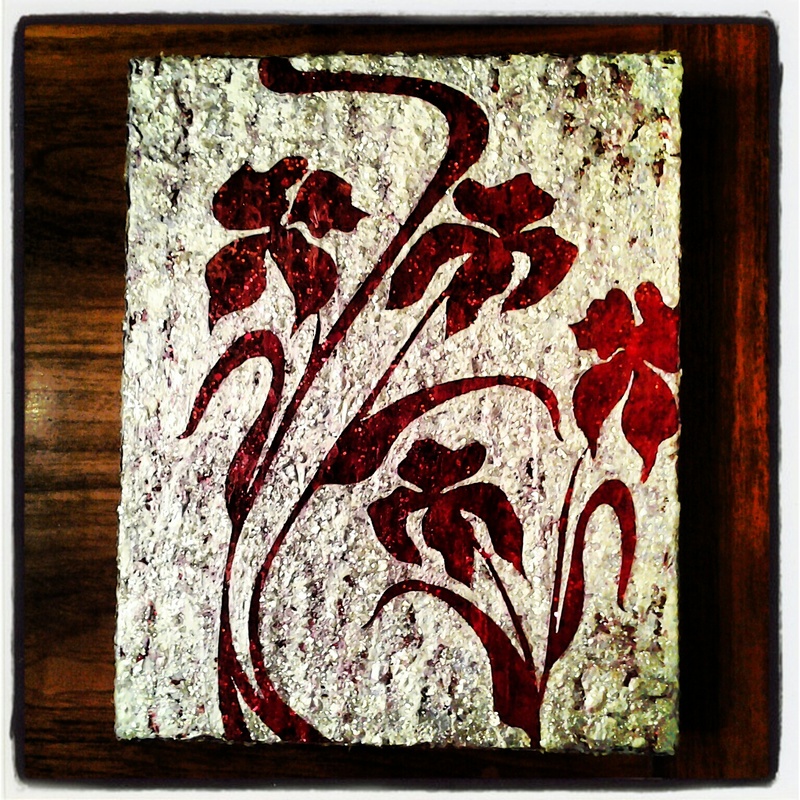 I already had a prepared canvas with layers of red paint glitter, glass gems & acrylic resin. It was originally for something else that didn’t end up happening. When I realized looking into its depth was akin to looking into that tempting heart-shaped ruby in the jewelry case at Jcp, I suddenly knew that I wanted to accent this red canvas with shimmering, glimmering frosted white like that of white sapphires or sparkling snow. Since flowers are often a part of Valentine’s Day I wanted them to be the theme of the piece. 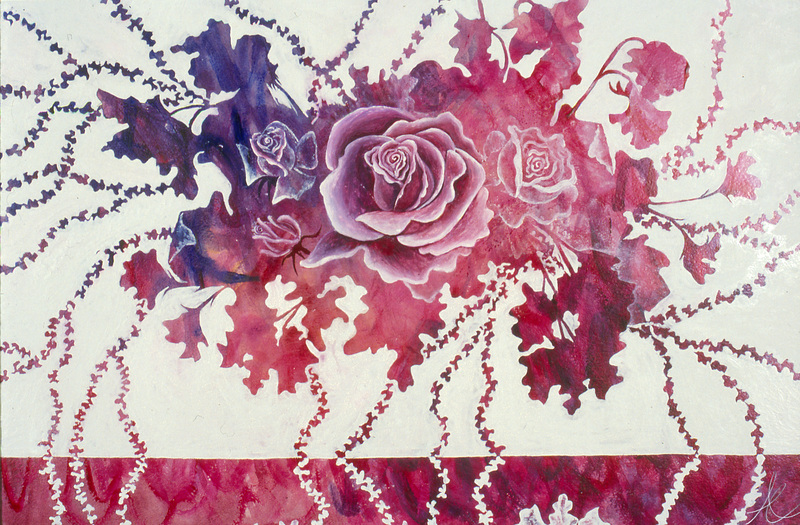 I used my stylized Moxie flowers that have adorned a few of my other paintings. I love curving, bold, extreme, yet feminine lines & a bit of whiplash curve every now & again. The moxie paintings reflect that bit of mania. So here you go…my February creation inspired by a sweet as candy heart-shaped necklace that not only caught my eye but shot its little cupids arrow right into my heart & seduced me into buying it. Yes! I totally caved. Valentines gifts you get for yourself are really the best though. I highly recommend making this day every year a day of spoiling yourself & others instead of always relying on someone else to make it happen. Show a little love for yourself today & also have a lovely day! Happy Valentines!!! 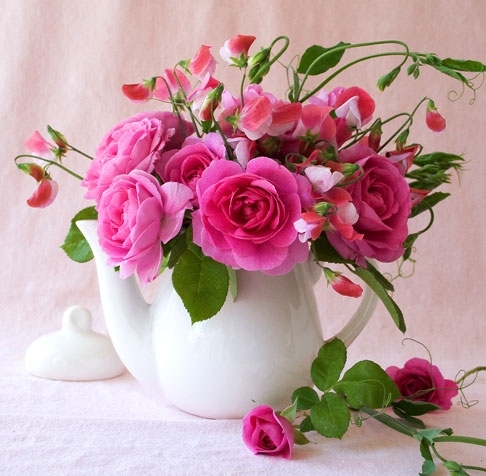 Inspired to Create by…Sweet Peas & Roses. I hope this Valentines day finds you all well & happy! I admit I haven’t had much luck with “Val’s Day” as I like to call it. Yes, there are quite a few stories here… I will say that my ex husband asked me to marry in on Valentines which was over fifteen years ago now & since it didn’t work out…well you get the idea. My best unsolicited advice is that, if you don’t have a sweetheart or if you aren’t sure the one you have can take the pressure, then have very small expectations for the day. The man I have been dating for the last five years + always somehow manages to get out of us celebrating this holiday at all…more stories on this subject that I don’t have energy to tell. This year I have decided I will buy my own chocolate & if I get a kiss from him I will be grateful. I think we both suffer from Valentine angst, though no one is actually fessing up. I am working on a set of paintings right now that has had me a bit preoccupied. I was thinking this morning how nice it would have been to have them ready to add to a post this morning but I am sleep deprived enough as it is. Then as I was driving the children to school it hit me like a lighting bolt….I have the perfect inspired creation for this lovely Val’s day to share. I will tell you all day long, that roses are not my favorite flower but if you knew how many I’ve collected, planted, drawn & painted over the years you would think this was a lie. I am a Libra so beauty & romance is my passion. That is the excuse Davy gave me for it anyway. I am worried at times it is really just an undiagnosed mental disorder. I have always loved to have flowers around me & in my home. 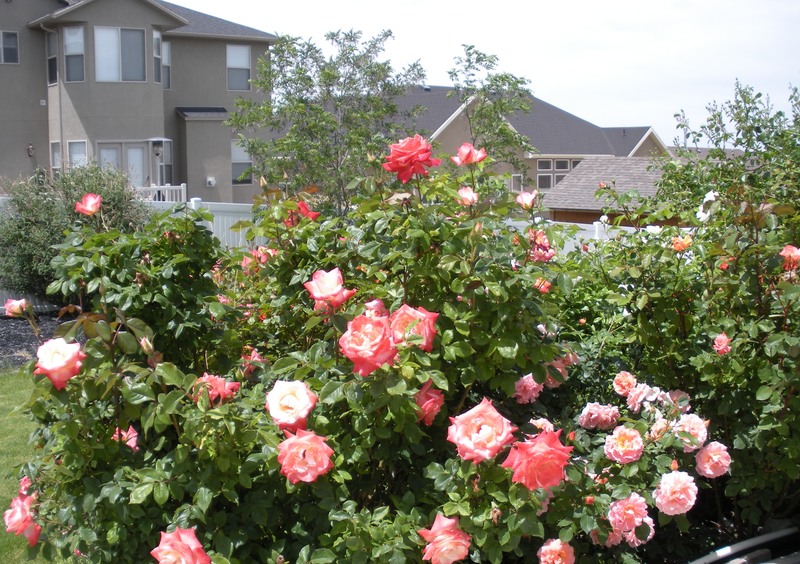 A few years back I had a rose garden right outside my office window so I could open up my windows & let the breeze invite in the fragrance which I would just drink it in as I was designing. Summer through fall I had cut roses almost every day inside the house, in nearly every room. I am not sure when I began to develop a passion for all these frilly flowers. I was a bit of a tom boy in my youth. I used to wear combat boots with my dresses in my teens…that paints a picture for you doesn’t it? Did I mention that I am a contraction already? Maybe my flower lust has something to do with an art assignment I did in High school using acrylics & gesso paints. I am not sure what the criteria for the assignment was (it was that long ago) but I painted a stylized slightly abstracted painting of Roses & Sweet Peas for it. Someone bought it after that. I am not sure who. Some other school I think. I remember taking my money to buy new prismacolor pencils. Yes, that is what you do when you are a poor artist in school. I do however have a digital file so prints can be made up through imagekind if your heart so desired. “Roses are red violets are blue”…I am going to have a great Valentines day (as long as I get my chocolate) & I hope you do too! In all seriousness Have a lovely day full of love & happiness my friends.